Supported by the Bill & Melinda Gates Foundation, InterMedia, Washington, conducted an India-wide survey of 45,024 adults, ages 15 and older, from October 15, 2013, to January 8, 2014, to understand their financial behaviour and their access and use of digital financial services. Results of the survey show in Gujarat in poor light. 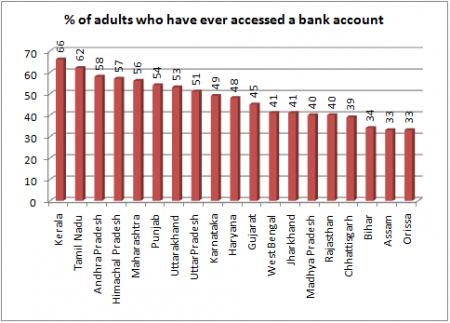 They suggest that Gujarat’s 45 per cent of adults have ever had access to a bank account, which is worse than 10 major states out of 19 states. The survey results further reveal that 26 per cent of the adults in Gujarat have active digital accounts as of today, which again is worse than several major states, including Maharashtra (35 per cent), Tamil Nadu (34 per cent), Kerala (33 per cent), Himachal Pradesh (32 per cent), Andhra Pradesh (29 per cent), Karnataka (31 per cent), and Uttarakhand (29 per cent). What is even more appalling for Gujarat in is that the state’s just 13 per cent below poverty line (BPL) adults have access to digital accounts, which is the worst than all Indian states. 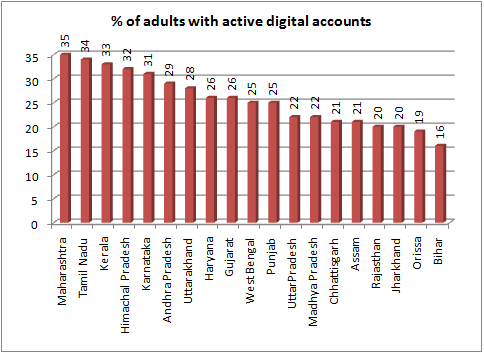 While comparable states such as Himachal Pradesh (32 per cent), Tamil Nadu (30 per cent), Andhra Pradesh (25 per cent) and Karnataka (24 per cent) have performed much better in providing active digital bank account services, with facility for digital transfer of funds, the poorer states are not far behind. 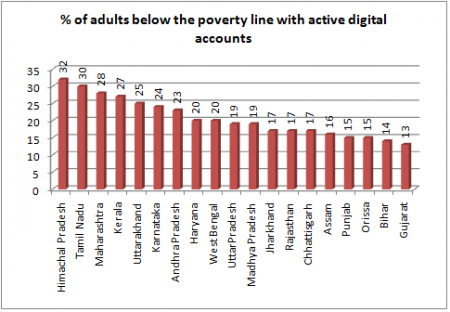 Thus, even the poorest states Bihar’s 14 per cent of BPL adult population has digital account, while is it 17 per cent for Jharkhand, Chhattisgarh and Rajasthan, and 19 per cent each for Uttar Pradesh and Madhya Pradesh. It suggests that the Gujarat officialdom has failed to stir financial inclusion among its poorer sections to open and use bank accounts, despite the hype around it. The Gujarat situation is particularly appalling in the rural areas, if the survey is any guide. Thus, Gujarat’s 19 per cent of the adult rural males own digital account, which is worse than all states, except Bihar (18 per cent). 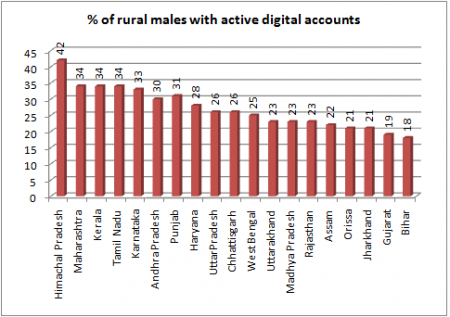 The best performers are Kerala and Tamil Nadu with 34 per cent of the rural males having digital accounts. The figure for Chhattisgarh, a poor state, is an appreciable 26 per cent, while it is 25 per cent for West Bengal, and 23 per cent each for Madhya Pradesh and Rajasthan. Worse, Gujarat’s just about 8 per cent rural female population has active digital bank account, and here too all states, without exception, are found to have performed better. 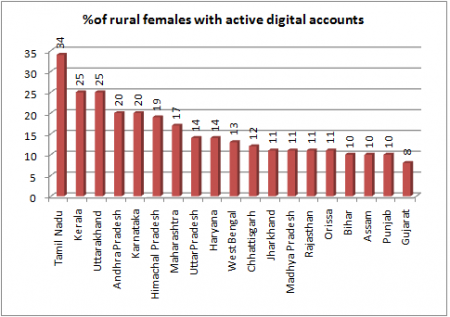 The best performer as far as rural females with active bank account is Tamil Nadu (34 per cent), followed by Kerala (25 per cent). Digitized government payments have the potential to help drive greater use of digital financial services but challenges remain. Beneficiaries see advantages of using the DBT method to receive payments into their bank accounts, including fewer delays and full receipt of payment. But the process of switching to DBT needs to be easier and more efficient. Recommendation: Registration and payment tracking services should be linked to UID numbers. Benefit payments are small, sometimes infrequent, and do not currently help to expand digital transactions. Awareness of digital financial services (DFS) is low, but many are interested in learning more about conducting electronic transactions, including savings. Recommendation: The use of voice-based applications can help raise financial awareness among mobile phone owners with low literacy and low digital skills. Beneficiaries have to be incentivized to reduce payment cash-outs and to use linked digital products. Banks also need incentives to design and market products to DBT account holders. Recommendation: Interest-bearing savings products and bill payment services should be added on to beneficiary bank accounts to encourage digital financial services uptake.